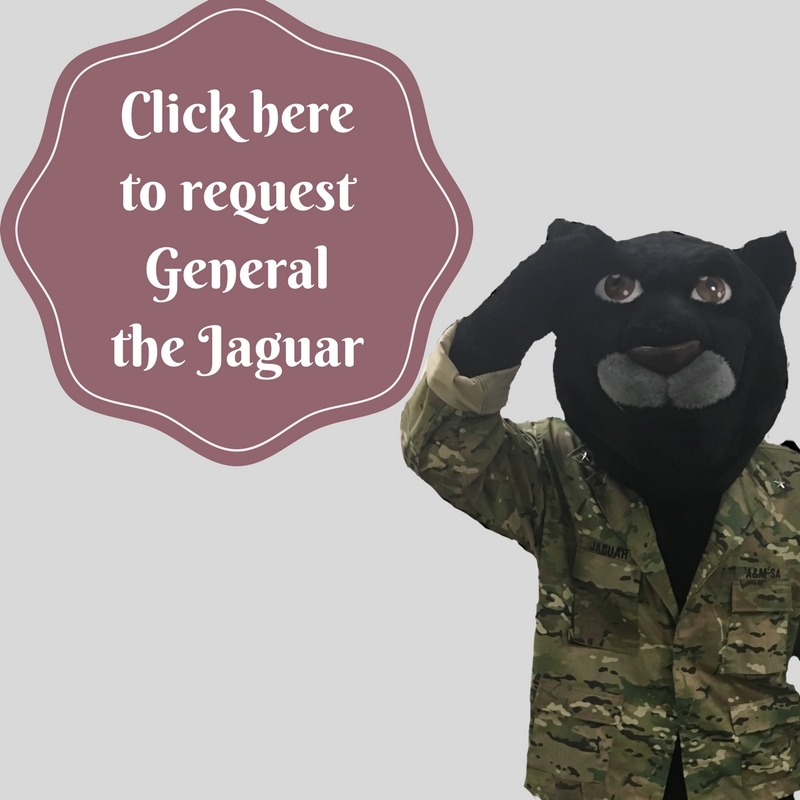 General the Jaguar will be unavailable for requests from May 6 through May 14 as he will be studying for and taking his finals. The Office of Recreational Sports is happy to help your organization or event with a mascot appearance. The following are the policies with an appearance request. We cannot guarantee that your request will be filled. Once you have submitted your request, you will be contacted concerning your request. ***Request forms must be received at least two weeks prior to the event. Submission of this form does not guarantee General the Jaguar will be able to fulfill the request. We reserve the right to cancel an appearance due to illness, inclement weather, personal emergency, and/or scheduling conflicts. A private and lockable changing room must be made available for appearances. No public rooms or restrooms are acceptable. This is meant to protect the anonymity of the mascot. Additionally public restrooms are often too small for the mascot to change in. General the Jaguar may appear either 1 hour per event, or make appearances up to 30 minutes long with 5-10 minute water breaks in between appearances. The mascot does not talk. The mascot costume cannot be rented or loaned out. Parking close to the event must be made available. General the Jaguar will be accompanied by a chaperone who will speak on his behalf at all events. General the Jaguar is the official mascot of Texas A&M- San Antonio. When the mascot is at appearances and events, photographs may be taken and used for personal use only. No company, organization, or individual is allowed to use photographs of General the Jaguar or any additional Texas A&M - San Antonio marks for advertisements. General the Jaguar at any appearance or event does not constitute promotion of any product, service, and/or person by Texas A&M - San Antonio. For use of the Jaguar image for promotional use leading up to the event or afterward and other brand guidelines, please contact Brandon Oliver, Creative Design Manager, at (210) 784-1102 or Brandon.oliver@tamusa.tamus.edu. A friendly and safe environment must be maintained. The mascot reserves the right to walk away from any appearance deemed unsafe or harmful.